First there was JDeveloper 10.1.3.3. See the list of changes here. A few minutes ago John told me, the Oracle APEX development team released their patch for APEX 3.0. The patch set notes you find here, the download here. 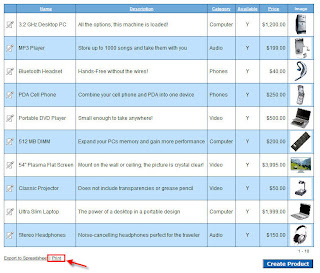 I just got a message of Lewis Cunningham he posted his Podcost of ODTUG on his blog. It was really fun doing my first podcast. Lewis is a great guy to talk to and a nice person to get interviewed by. That was definitely a highlight at ODTUG and something to be in the history books as the first real interview of the Apex Evangelists. 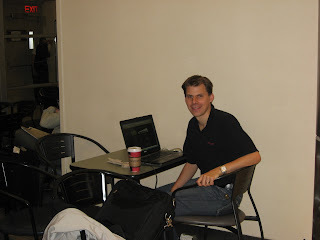 I'm currently waiting in Atlanta together with a lot of other ODTUG participants. 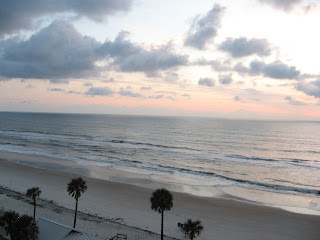 My overall impressions of Daytona Beach and the conference are positive. Last year it was my first time in the States. At that time I didn't know what to expect and the whole experience was unbelievable. After that conference I went to other conferences in the States, like Collaborate and Open World and I think I'm getting partially used to it. Although the States are still "big" and impressive, but I suppose I already expect the most unbelievable things. At every conference I learned something new, not only technical but also personal. 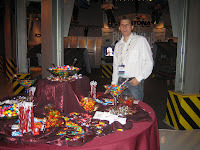 Nevertheless, my biggest interest for doing theses conferences is networking. Putting some faces on the people you see on the internet or just talking to each other in real life. Unbelievable, but I didn't sleep well again! My mobile phone was switched off, no mosquitoes, I was tired and fell asleep almost immediately. But at 4h30 I got a cramp in my leg (convulsion in calf). It really hurt, it was such a heavy cramp I have never had before! This morning (and even during the day and night) my leg was still hurting. I couldn't walk without pain... it still hurts, but what can I do about it? I suppose it's due to the food, the air co and not having drunk enough. 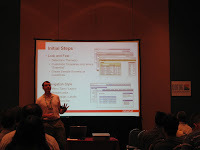 The first session I followed with Managing Large Application Development Using Oracle Application Express by David Peake. David explained his experience from the 4 years he worked at a big client in an APEX development project. How do you get the best results of your team and how do you structure your work, were one of the questions he tried to answer. 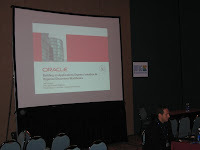 The next session was about Oracle XE for internet Applications Generated by Designer by Marc de Oliveira. I'm not such a huge fan of Designer, maybe because I don't know it. But I think what he tried to do with Designer, generating web applications, he could have done in APEX in a lot less time. But again, I don't really know Designer, so maybe there was a purpose to do it with Designer. 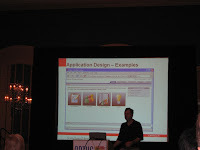 The last session I followed was Application Express for the Designer Web Generator Expert by James Hudson. Basically what I saw in the previous session, James explained how to migrate from that to APEX. I found it interesting to see how, with his knowledge of Discoverer, he did his migration. We got a last sandwich lunch and said everybody goodbye... Some last moment picture were taken. Now it's time to prepare for going home. Most of the people left today or will leave tomorrow. The first session I followed was APEX Lessons from the Trenches by Bill Holtzman. Bill explained the lessons he learned after creating his application for the National Air Traffic Controllers Association (NATCA). My next session was Advanced Application Express Programming Techniques by Michael Hichwa. 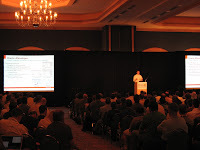 The "father" of APEX explained his best practices and showed some sample (packaged) applications where it was used. 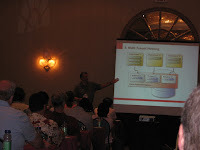 The big topics where: database design, development guidelines and User Interfaces (user experience). His presentation was based on his experience and the Best Practice whitepaper published on OTN by Sergio Leunissen. During lunch I did my first Podcast! Lewis Cunningham interviewed me about Oracle Application Express, the Apex Evangelists and our European APEX Training Days. I didn't hear the result yet, so I wonder what it will sounds like. I suppose you hear the ocean, as the interview was outside. Nevertheless, I was very honored Lewis asked me for that quick chat. Thanks Lewis! 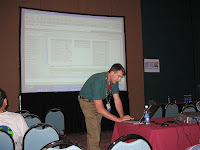 The first session in the afternoon was about creating an interface in APEX to organize Discoverer Workbooks by Jeff Hohman. Jeff showed his application, but on an APEX point of view it was a simple application. Basically what he did was creating a report and form which allowed to open Discoverer Workbooks with an url from APEX. If people are using Discoverer, this presentation can be useful. It explains how a Discoverer url looks like. Then it was my turn! APEX by Example: Shared Components by Dimitri Gielis. This presentation was the same as the one I did at Collaborate in Las Vegas. As I already knew, doing this presentation is a challenge, as it's a bit too much for a one hour presentation. My goal was to give an overview of all Shared Components and focus on some of them (demo), as I believed they aren't used/known that much. I think I achieved this goal, as even Patrick Wolf told me he had learned something new. I showed SSP, the Build Option, Shortcuts & Subscription and UI Defaults. Some people liked it very much as I got some nice feedback, but I'm pretty sure some others found it too much information and a too quickly change of "topic". But I'm glad I did it this way, as I believe my paper/presentation is ideally to get people thinking and putting them in the right direction of more advanced APEX skills. Sidemark: I think the audience at ODTUG is different then the one at Collab. 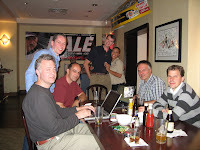 I believe there're only (or the vast majority) technical people (developers) at ODTUG, where at IOUG Collaborate you've more a mix. For one or another reason I felt that during the presentation. The last session of the day was one of Patrick Cimolini about APEX and Project Management. I found it an interesting presentation to know how others start, develop and deliver an application. APEX is a Rapid Application Development Tool, but some people sometimes forget that you should treat it as just another development project. Even I must sometimes force myself not to start developing directly, but first make a project plan. 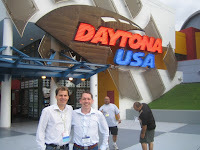 In the evening we went to Daytona USA to have an insight in the Nascar hype of Daytona. I found it really interesting and had a terrific time. I raced against Patrick, which was really fun and we also saw an iMAX movie of Nascar. 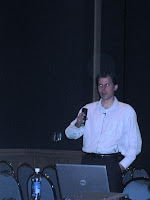 Before beginning the second (and last day) of APEXPosed, there was the ODTUG Keynote. 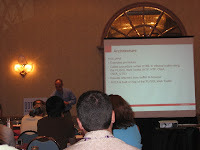 Ted Farrell, VP Tools and Middleware gave an overview how he sees the Software Architecture in the New Era. Most of his talk was about Fusion and Java (ADF). I'm pretty sure some experts in this area will blog about it, so I won't go into a lot of detail. One thing however I found quiet nice, was his demo about some new things in JSF. He showed some drag-drop capabilities, some animation when something loaded (get data), in fact an improved Amazon, if you like. In one screen you could check out and do changes on the fly, which I think is more user friendly. Behind the scenes a lot of that is AJAX, which you could use in for ex. APEX too. 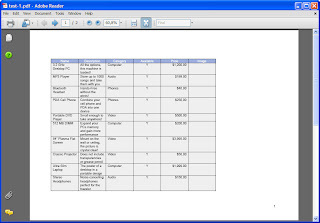 PL/PDF is quiet handy when you want to create some advanced reports from PLSQL. I definitely found it an interesting session. A few weeks ago I was looking into BI Publisher (the XML/XSL way), but PL/PDF can maybe do even more advanced reporting, although it's quiet different. PL/PDF is programming PLSQL to make your report, where in BIP you could also use Word templates for ex. During lunch the Best Paper and Best Speaker award got delivered. The Best Paper went to Wilfred van der Dijl, where the Best Speaker award was for Maggie Tomkins. In the afternoon Joel Kallman talking about Managing APEX, which I found really interesting. This session was the most advanced one and maybe some people don't really care what is happening or how you can manage an APEX instance. It all depends how far you would like to go with the product, but I think it's always nice to know how something you're using works. The last session of the day was about APEX APIs. Raj got deeper into APEX_ITEM, APEX_COLLECTION, APEX_UTIL and APEX_MAIL. Something you could expect from an Advanced training session. On the hand of a tabular form he touched the most importing things in the APIs area. 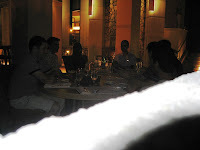 In the evening there was the APEX SIG meeting. 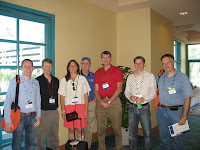 A bit the same as at Collaborate, but where before it was organized by IOUG, it now was an ODTUG session. 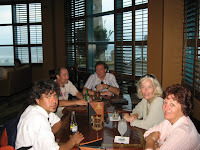 In the evening I quickly went through my presentation and had a drink in the bar of the hotel with my other APEX friends. Tomorrow it's my turn to give a presentation... I hope I can learn the people something after a full 2-day APEX training. These screenshots are "pre-pre-alpha" and very preliminary screens of the final implementation. They are subject to change, maybe it never makes it to a release or it will work different. In other words, Oracle doesn't engage or promise that it will be like that or that is will be ever available. But, I'm nevertheless really happy I can publish this "ultra, super cool" new feature/product or you name it. Thanks Mr. AJAX and Oracle! I didn't sleep that bad tonight. In the morning I checked my mails and worked a bit. Today APEXPosed started. You had to pay extra for these sessions, so it wasn't the regular ODTUG Kaleidoscope track. The topics they covered with a bit of explanation and my view on things. The time I arrived they just had to refill all sandwiches, so that was a bummer. I'll tell you tomorrow if it's good. Today I didn't have that much, some fruit and muesli. Mike started to talk about the history of APEX. Let's say before 2004, and the lessons they learned from it. Then they started to build APEX from scratch again with the first release in 2004 called HTMLDB 1.5, followed by 1.6 with the Themes quickly afterwards. 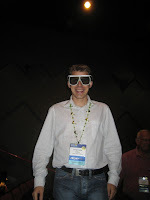 Mike also showed his 10 most "cool" features of APEX. Then we got to the really interesting stuff! APEX in the future. There will be first a patched version of APEX 3, called APEX 3.0.1 (foreseen for this month). This version will also be shipped with the Oracle Database 11g. As I blogged yesterday, the integration with SQL Developer will be enabled too. Mike demoed some cool things, like deploying an APEX application right from SQL Developer! As we already could see, you get some reports and more insights into the APEX dictionary too. This version will also probably work with Oracle XE... with maybe some installation guide. So what will be in APEX 3.1? This was absolutely fantastic! If you didn't already like APEX, you'll definitely like this version! What do you think of: Practical, Tactical, Easy, Database Centric, Declarative, Opportunistic, Super Fast, Browser Based... and Pull Down Report Columns? Mike demoed APEX Worksheet! Man!! You can't believe it! There's a lot of AJAX inside that! I was a bit too late to tape it, but I'll get some more screenshot from Mr. AJAX himself. Later we saw where AJAX is used in APEX and got some exercises on that as well, like for ex. auto population and dynamic reports. It's always difficult to define "Advanced". I spoke with some people and they really liked it. Personally I already played with most of this. Nevertheless it was a nice exercise and overview again. We got some healthy food: a salad with some cheese and ham on. Some people didn't found it enough, but the dessert (some chocolate fudge pudding or cheese cake) was quiet heavy, so I didn't complain. 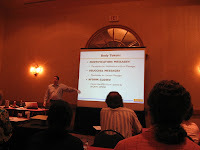 Scott explained the difference in Themes and Templates. And then showed how you could make another theme in APEX. He build the Apple website theme in APEX and explained while he was doing that the different steps to build it, the pitfalls and the tools who can help you with it. 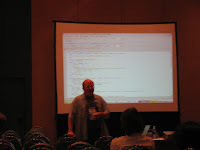 I believe this was a good session, especially if you didn't build a template yourself before. The experience and best practices Scott mentioned where also useful. I believe you learn the most from the experience of others. The main topics Raj was discussing where: Security Balance, Create & Review Example Application, Declaratively Locking Example Application, Programmatic Measures, Deployment, Considerations and Other Considerations. Raj pretty much mentioned every possibility you have in APEX to make your application more secure. In my session on Wednesday I'm also talking about Session State Protection, Authentication and Authorisation. He was talking about that too as also the use of bind variables and some other best/worst practices. This session was Q&A with most of the APEX Development team and the other speakers of APEXPosed. David Peake took notes, so it might be possible he'll give some feedback on that. The questions were the normal ones, as I already blogged before when we did the IOUG, OOW or ODTUG Q&A of last year. The reception is always a nice place to meet others. 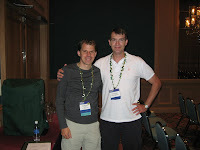 I saw Mark Rittman, the AMIS guys, Peter Lorenzen and a lot of others I got to know of ODTUG of last year. 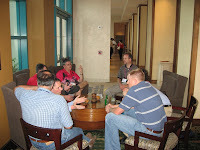 After the Welcome Reception we went to the bar to have another drink with only APEX lovers. There must have been around 30 people, which didn't make it easy. The larger the group, the more difficult it is to talk to everybody. Some pictures I took during the meetup. Today (Sunday) I didn't do that much. As a lot of people arrived today and yesterday I came across some friends. 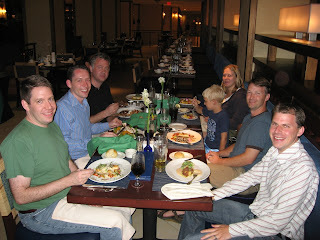 I saw Lewis Cunningham with his family, Wilfred van der Deijl and the AMIS guys like Alex, Aino and Lucas. Last night I stayed in the Comfort Inn, but to be honest, it wasn't that nice compared to some other hotels I stayed in before. The breakfast was included, but you could only have some limited donuts and a waffle. 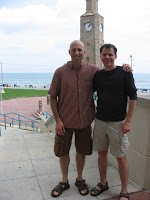 Patrick and I also scheduled to meet today, which we did at 9h30 am. 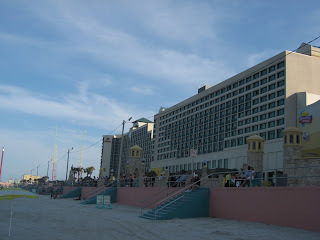 Almost all day we were together, heading between the beach, the pool and the surroundings of Daytona Beach. 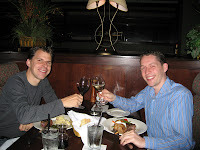 I really liked being together and chatting about APEX and life. At the late afternoon, something "special" happened. I got recognised while laying at the pool. 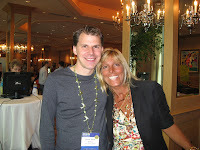 A friendly young guy from Latvia (now living in the States) recognised me from my blog! I was pleasantly surprised. When Patrick told his name (as he was laying next to me at the pool) the guy was really happy. In the evening we met Mike Hichwa in the bar and started to chat. I'm not sure I can give all details, but if you're an APEX developer, you should definitely start using SQL Developer. Something nice is coming up! On the picture from left to right around the table: Scott Spendolini, Patrick Wolf, Mike Hichwa, Raj Mattamal (he never wants to be on the picture), Kris Rice's wife and child, Kris Rice and myself. It was a lovely day and evening... tomorrow the real sessions will start. As some of you couldn't make it, here some more pictures and a video! Today (Saturday) I walked down the beach. The fresh air, the ocean, really nice. 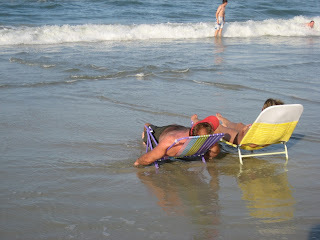 One thing however, the sun goes under in our sea... and that's not the case here in Daytona Beach. 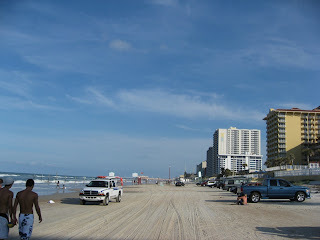 And on the Daytona Beach your car is allowed! 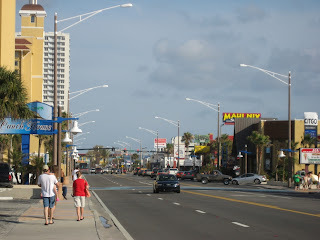 The other picture shows the Daytona Beach street and what happens when you fall asleep! 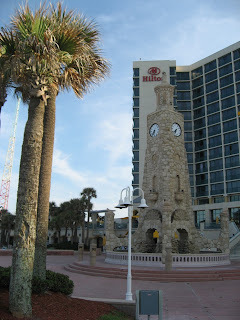 I walked to the impressive Hilton hotel where the seminar is going to be held. I wanted to register, but that's only possible from Sunday onwards. 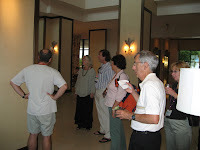 In the hotel I came across some other people, like for ex. Wilfred van der Deijl. The rest of the day I headed between the pool, the beach and my laptop. As for food, I started with some famous American Onion Rings and a typical burger. I'm going to sleep early tonight as I didn't sleep that well yesterday. 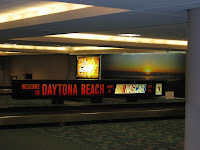 I finally arrived at Daytona Beach after 20h of travel time. It was already late in the evening. After having walked a bit down the street, to stretch my legs after only have been sitting down, I went to bed. I couldn't sleep that well. Around 5 o'clock I woke up again. John was online, so we had a quick chat. I'm staying in the Plaza hotel only for one night because there were no more rooms for today. From Monday onwards I'm staying in the Hilton, where Kaleidoscope is taking place. 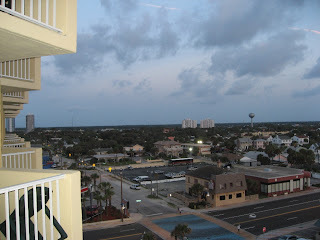 A picture from my balcony at 6:30 am: left the land view and on the right the ocean view. I wonder what that "boll building" is on the land view? My flight from Brussels to Atlanta had some delay, but I didn't worry about that, as I had/have to wait for over 6 hours in Atlanta. But I read a nice article in Sky Magazine about "Blackberry addiction". I must say the article sounded familiar. I also admit I'm addicted to mail, blog, internet, ... I'm not using a Blackberry, but a pda (HTC P3300). For ex. yesterday, I was at the Oracle Benelux OPN Days and between sessions I quickly connected with GPRS to read my mails. But it was not entirely my fault! During the OPN Days we needed to leave our mobile phones on, because they sent us messages with special announcements. They also created a site where you could search for other people and network with them. There was also an interactive session where you needed to vote on questions. One of the questions was: "Where would you like the next OPN Days be held?" The last days were a rush... a lot of meetings, everybody coming at the same time and next to that trying to get the deadlines in some projects... My blog was a bit silent, but that will change in the coming days! 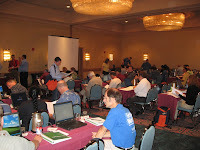 Today I'm leaving for Kaleidoscope 07 (ODTUG), held in Daytona Beach, US. It's not that easy for me to go there. 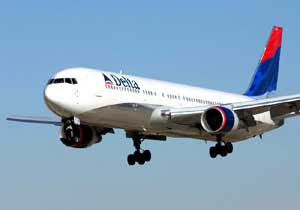 I'm flying over Atlanta where I need to wait for over 6 hours for the connecting flight to Daytona Beach, but it will be worth it. Last year I really liked ODTUG. It was at that time also my first time in the States. I blogged every day and will try to do that again now. 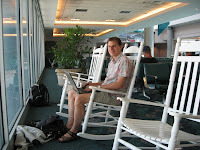 I hope there's some free wireless in Atlanta, so I can finish some blog posts I started. I updated the Apex Meetup website with the date. 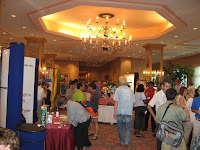 We'll meet on Monday during and after the Welcome Reception. It's a pity that some sessions are going on at the same time, but it's also a proof APEX is getting more known. Next to the two days APEXPOSED, there're 13 sessions dealing with APEX. Compared to last year that's a hugh increase! Wesley Brown and Krupa Ramachandran, St. Jude Medical Inc.
Future development tools present a quandary for companies who were geared heavily towards Oracle Forms/Reports. Strategies on how to keep currently deployed applications/reports up and running while deciding which Web tools to use and how to train developers to use them must be defined. Also, providing users with the same "Look and Feel" with a common point of access for both old and new Applications / Reports is a goal. We have taken a "transitional" approach as a solution. We chose to start with APEX and ASP.NET which we consider intermediate Web development technologies relatively easy to use with Oracle database yet powerful. Our developers have been successful in deploying new projects utilizing these environments and incorporating them into the traditional Application Launch interface with users unaware of which tool is being used. In this endeavor we have discovered how we can develop projects in several environments seamlessly without disruption of service to our customers and are taking steps necessary to fully utilize Web-based tools in the future. This presentation is a detailed discussion on how an Applications Express (APEX) application can be configured to handle both business rule violations and run-time errors. Business rule violations are detected in triggers and then raised to the GUI where the user is presented with a context sensitive message that contains the information that allows the user to correct the problem. Run-time and system errors are logged in the database and then passed up to the user. A professional validation and error handling strategy is a key component in building robust, user-friendly systems. The points will be illustrated using one of the presenter's production systems. 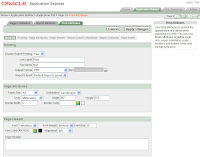 Application Express enables rapid and efficient development of secure and enterprise-level Web applications. Like any platform, there are numerous tricks of the trade that one learns only after getting waist-deep in the coding. The National Air Traffic Controllers Association (NATCA) has been digging successfully in the APEX gold mine for three years and has a wide assortment of coding techniques to share with those undertaking or considering expanding their use of APEX. When you deploy an Oracle APEX application on the public internet you have to assess the level of security needed. If your application only contains non-sensitive data you may be able to deploy it in much the same way as you would on your intranet. However, if you need to secure your application, there are a number of things you need to consider. This presentation will explain some of the risks and how to minimize them. Some of the issues we will discuss are cross-site scripting, session state protection and SQL Injection. We will also look at some of the things you can do to secure an Apache HTTP Server. Learn Michael Hichwa's perspective on how to develop Application Express (APEX) applications from data model to user interface. Get recommendations for source code management, upgrades, and customizations. See how to exploit new Oracle APEX 3.0 features. See techniques to improve and test performance. 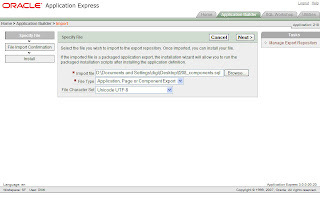 Oracle Application Express (Oracle APEX) is a Web-based, application development and deployment tool integrated with the Oracle Database 10g and Oracle Database 11g. Oracle APEX enables anyone with only a Web browser and limited programming experience to quickly create secure and scalable Web applications that can be instantly deployed to tens, hundreds, or thousands of users. This presentation and live demonstration positions the tool and provides an overview of its features and capabilities. We'll look at Oracle Application Express 3.0 new features, such as Flash Charting and PDF Printing and Reporting, discuss the future direction of Oracle APEX and show examples of why it is one of Oracle's most popular technologies. 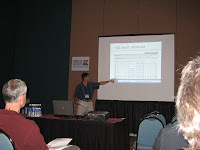 This session will provide users with an alternative to organize their workbooks using a somewhat open source solution. Because of the flexibility involved changes in the product can be easily compensated for, thus, making this add-on highly beneficial. you can use Shared Components. This session covers all available Shared Components; it tells you what it is for, why to use it, and how to use it in a real environment with the "DG Tournament" application. 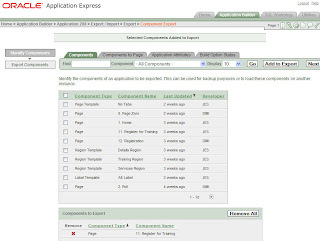 Application Express (APEX) is a robust and productive development tool, however, even APEX projects can be late, over budget, and of dubious quality if they are not well managed. Looking at APEX from a project manager's perspective, the following questions are addressed: How long will a project take? What tasks needs to be done? How long will a single task take? When should the tasks be done and in what order? Who performs the tasks? What skills are required? How are source code and versions managed? What quality can be promised and delivered to the customer? Quantitative metrics and a production application will be used to illustrate the points. application started over four years ago and has successfully been implemented as the primary enterprise-wide OLTP system for a large law enforcement agency with thousands of users. ways to "think" in the APEX tool and use advanced features provided out-of-the-box by APEX. The session shows how Designer experts can pick up APEX fairly quickly and build new apps, convert existing apps, or integrate the two. With every passing day, the functional boundaries between traditional client-server applications and Web applications decrease. New technologies such as SOAP and Ajax enable Web applications to function and perform like traditional fat-client software. 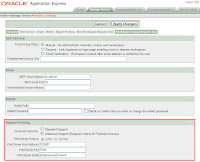 In this session, I will show how to integrate the E-Business Suite flexfield functionality into Application Express. By leveraging the power of Ajax, Application Express can use descriptive flexfields to create rich Web applications—applications that can change shape and purpose on-the-fly, enhancing the user experience by not reloading the page and minimizing future coding by developers. In APEX 3.0 it's possible to print pdf's using an externally defined report server. 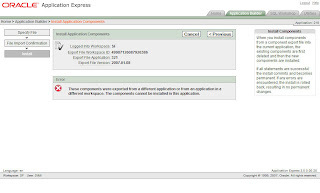 There's a good document on OTN to configure this printing feature in Oracle Application Express. Installation of BI Publisher was amazingly simple! After 6 minutes the Basic installation (on Windows XP - btw unsupported!) was done and my server was up-and-running. The report is not yet completely like I would have it to be (for ex. with pictures, nicer scaled, headers and footers), but that will be another post. 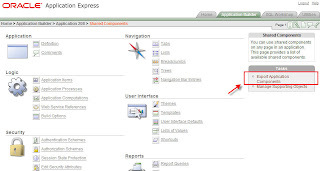 Not sure if you already saw this feature in Oracle Application Express? On the left, you see you can export almost every APEX component. On the right side you see the import functionality (Application Builder - Import). There's no problem when you stay in your current application. You can nicely export and import components. If you try to import the component in another application, you get an error (see below). If you try to import the component in another application of another workspace, you get the same error (see below). There's no workaround for this, except to export the whole application from one workspace, import it again in the other workspace and create components as copies of the components of the imported application. Life would be a lot easier to have the export/import functionality as it would allow to copy (and subscribe) more components at once. I like the feature, don't get me wrong, and I understand the difficulties of doing it (changing id's). Nevertheless I hope in APEX 3.1 or 4.0 it will be extended so it also works cross workspace/application. In the meanwhile, if you want to reuse components, make a "Shared Application" and when you start a new project import the entire application into your workspace (if it's cross workspace).